This article first appeared in Aligned Magazine in 2012. People oftentimes ask how I went from graduating in Kinesiology (study of human movement), to a career as a Professional Organizer. It’s actually fairly simple. I love working with people. Oftentimes in my profession as a Professional Organizer, I have to understand the way a person process things and how their brain works. Asking leading questions for increased understanding is necessary in developing organized processes that make since to that particular person. 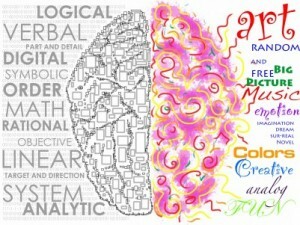 Right Brain Thinkers: Free thinkers, artistic, less focused on organization, musically inclined, spontaneous, large group of friends, outgoing, communicative, feeling-orientated, comfortable in large groups and/or being the center of attention. Left Brain Thinkers: Literal thinking, more reserved, comfortable in smaller group/ small group of friends, organized, follow manuals, focused on one task, increase of anxiety levels, plan things out, on-time, rule followers. Designate time to file: Once a week, designate the same time on the same day to complete your filing. Oftentimes right-brained people have a pile-to-file and items stack up over time and get pushed to the side as new and exciting things come up. In order to prevent this from happening, devote 15-30 minutes into your weekly schedule and stick to it. Use colors and pictures: Whatever you are trying to organize, use colors and pictures to help organize your brain. By color-coding things (files, boxes, clothes), you are more likely to follow the organizing process that is established. Maybe your brain doesn’t work ‘alphabetically’, so use the colors of the rainbow instead! Plan your week: On Sunday night, or early Monday morning, plan out your week and the main tasks that you’d like to accomplish each day. Make sure that there is a balance between work and play, interactions with people and quiet time. Visualize: Close your eyes and visualize your ideal, organized space. What does it have in it that you don’t have right now? Slowly incorporate in these changes. Lists: Keep to-do lists for the different aspects of your life – Home, Work, and Play. It is very important that you designate time into your schedule for play. Read a book, go on a walk, do yard-work, or take a weekend trip. During this time of play, focus on clearing your mind, enjoying the break, and lowering your naturally high anxiety levels. File: Set up your paper filing system like you would your electronic files. Group together a main topic, and include alphabetized sub-topics. Let Go: Consider letting go of one small thing/task each day. Allowing yourself a ‘break’ from a task that you normally accomplish multiple times a week (laundry, dishes, vacuuming, filing, returning a phone, etc.). The extra break is good for your body, and also for your brain! Breathe: If you find yourself beginning to get overwhelmed or overly-anxious, take a few minutes to focus on your breathing. Once your heart-rates slows back down, you will be able to focus on the task at hand and accomplish it much easier! Understanding the way that you individually process things is key to your success. I encourage you to spend some time this week learning about your brain, the way you process, and your personality. Want a more in-depth study? Take the Myers Briggs Personality Test to take your organizing one step further!